LOOKING FOR ANNE OF GREEN GABLES: The Story of L.M. Montgomery and Her Literary Classic by Irene Gammel. New York: St. Martin’s Press. 2008. I loved ANNE OF GREEN GABLES as a kid, and was delighted to receive it in hardcover, along with its sequels, over a period of years. I found copies of the EMILY books, PAT OF SILVER BUSH, etc. in thrift shops, and gobbled them up, too. Yes, as I grew older, I recognized the idealistic/unrealistic environment of the books. I alternated between getting irritated by it and feeling comforted by it. A few years ago, I added copies of L.M. Montgomery’s journals to my personal library of journals and letters. Five volumes of “Selected Journals”, edited by Mary Rubio and Elizabeth Waterston, ordered out of Canada, and AFTER GREEN GABLES: L.M. Montgomery’s Letters to Ephraim Weber, 1916-1941 (which Strand Books tracked down to me). One of the things that surprised and saddened me was how unhappy Montgomery was in her diaries. What gets frustrating is her refusal to change what makes her unhappy. In 2008, the family’s revelation, via CBC that Montgomery committed suicide (link to article here) was another sad revelation. Gammel discusses this revelation in her review of Rubio’s biography of Montgomery that released in 2008 (link to review here). On the one hand, it makes sense to whine in a diary. The diary is a place to deposit what stifles one’s soul, so that one can move on and make better choices. But in volume after volume, there isn’t an indication of making better choices — there’s a continued cycle of unhappiness and nasty comments about those around her. Since these are “Selected” journals, one has to wonder why these particular passages were selected — were they the most upbeat of the content? If not, why not choose a wider range of emotions? Choices? Gammel’s book is much more upbeat. She doesn’t deny Montgomery’s sharp tongue or unhappiness, but she also reveals, through letters and journal entries marked as “unpublished” a much livelier, funnier, intelligent woman. Montgomery was determined to create her an identity for herself — ANNE allowed her to do it, although later in life than she would have liked. When Montgomery finally managed to travel to places like Boston, she was able to partake in intellectual and cultural events she dreamed of up in Prince Edward Island. The reader gets to see Maud taking and receiving pleasure from the reception of her work. The chapter detailing the evolution and social context of “orphan fiction” is especially interesting. It traces inspirations for Anne and how other orphan girls named “Ann” set the stage for the beloved Anne Shirley, and places Anne in context with other popular characters of the time such as Rebecca of Sunnybrook Farm, the Pollyanna franchise, and Little Orphan Annie. I consider setting as an additional character in well-written stories — if I read another Ye Olde Generic Scotland in a novel by someone who’s never visited Scotland or bothered to research properly, I am going to HURL — so Gammel’s exploration of the power of place and nature, and which settings inspired important locations in the book resonated strongly. Places such as Lover’s Lane, The White Way of Delight, the Lake of Shining Waters — all bring back fond memories both of the book itself AND memories connected with the experience of reading the books. That, I think, is one reason the books keep resonating, and people smile when they remember reading them. The book is lively, well-written, thoughtful, and a good counterpoint to the sadder published journals. If you’re in the area, come by Marstons Mills Library yourself to check it out (and find other jewels in our collection), or order it via CLAMS network. I intend to track down and purchase a copy for my personal library, in addition to recommending it to library patrons whenever appropriate. 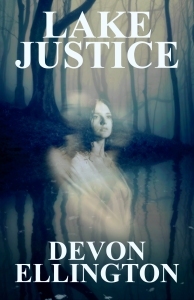 “Lake Justice”, my ghost story, released on April 27, 2014, courtesy of Amber Quill Press. It’s only a buck, and you can buy it here. Can a witch chaperoning her godson’s camping trip lay to rest the ghosts of murdered women? Or will Lake Justice take its own revenge? When Bronwyn Rowan, a practicing witch, gets talked into chaperoning her godson’s trip to Lake Justice, she doesn’t expect to find some of his classmates have untapped paranormal talent, or that they’ll need to use it to thwart a serial killer and lay to rest the ghosts of the killer’s previous victims. Question: What was the inspiration for this piece? Devon Ellington: Photographs I took up in Maine, visiting family. They’re just north of Portland. It’s really spooky woods. Some days you can watch the fog roll down the street. One can see why so many horror writers originate in Maine! The forests have genuine personalities. There’s a sense if you intrude, there are consequences. I love old-fashioned ghost stories, and I wanted to combine that sense of the eerie lake in the woods with a ghost story. The characters of Bronwyn and her godson started talking, and I decided to follow them, at least in the first draft, to see what happened. Question: Did the piece go through many drafts? DE: Oh, yes. All my pieces do. “Editing” and “revising” mean more than running it through spell-check. I tore it apart and put it back together many times. I tried a few different antagonists, but the character who wound up as the primary antagonist in the piece was the most insistent, and, ultimately, the strongest choice. Question: You make it sound like the characters are separate from you. Aren’t you, as the writer, playing God? DE: I am and I’m not. Yes, ultimately, it all comes out of me, but from different parts. Our subconscious knows far more than our conscious minds about what works, what has integrity in a piece, and what doesn’t. The characters are created out of the subconscious and evolve, feeling like independent entities, but always tied to that core integrity. In early drafts, especially, I follow the characters and see where they lead me. As I revise, I layer in structure and deeper sensory detail, so that the craft supports the story and characters. But I usually start from character, try a few “what ifs?” and go from there. Question: You don’t believe in breaking structural rules? DE: I believe in breaking them if the writer has strong enough craft to break the rules while still remaining true to the characters and the genre. Outstanding authors are also outstanding craftspeople. They understand the craft of writing. When they break the rules, it is a choice, not an ego moment or out of carelessness. It works because it is a choice made out of deeply knowing and being rooted in craft. As a reader, it’s painfully obvious when a writer “breaks the rules” out of either ego or being too lazy to learn craft. Those aren’t writers I continue reading! I don’t mean to sound perfect, because I’m not. I rely on my editors when I go off the rails. I like and need to try new things. Not everything works. But I try to learn from every piece, from every note an editor gives me, and apply it moving forward. If you look at each note as only pertaining to the words on which it was noted, you cheat yourself, and, ultimately, you’re wasting your editor’s time. Learn, understand, apply. <strong?Question: What happens next between Bronwyn and Kyle? Will we see more? Will Bronwyn train the kids in their talents? DE: The story was written as a stand-alone, but if readers want to see more with these characters, I’m open to it. Definitely give me a shout, and I’ll see what they do next! Available from Amber Quill Press here.